Littel missy innocint mi. Neva!! An iffin itz aboutz da ovorterned soupz tureen, itt wuz da goggie. Yeesh. Conga dere annipuss. Itz bin raynin hear. Whee kneads itt. Haz been clowdee awl dai 2dai (dark naow) but no rayn an still myled fur teh tiem uv yeer. Wassnt teh ginney piggies in Alis in Wunnerlan also repressed? verily gud linkin dere lungdoc. ai fergotted sew much ov da gud stuff in dat storee. Troo! Looks exotic, lyka Savannah kitteh or whatnot. A good listener, Aifinkso! 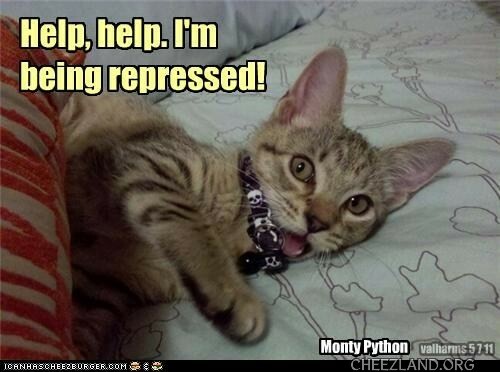 Yoo am being repressed? Wai? Furst pressing nawt werk? Yoo awl wrinkled? sumwun tew halp tihs pore kitteh babey awt? yay fore teh slightlee bork night! Hee hee hee! Moar Alis! (Onlee dis bit from the Luking Glass.) Yay!